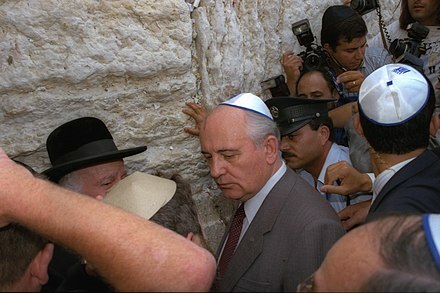 This name uses Eastern Slavic naming customs; the patronymic is Sergeyevichand the family name is Gorbachev. 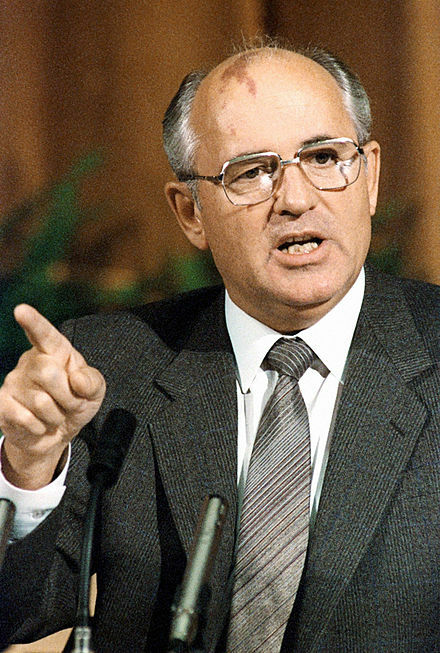 Mikhail Sergeyevich Gorbachev [lower-alpha 1] (born 2 March 1931) is a Russian and formerly Soviet politician. 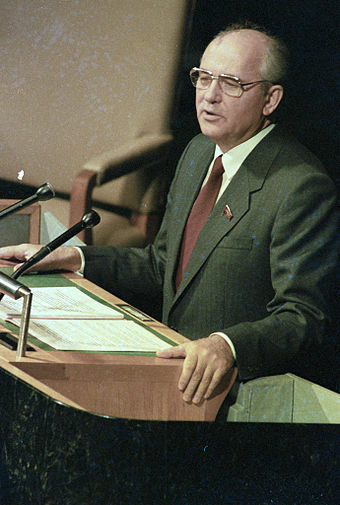 The eighth and last leader of the Soviet Union, he was General Secretary of its governing Communist Party from 1985 until 1991. 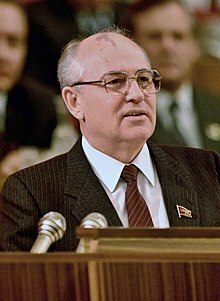 He was the country's head of state from 1988 until 1991, serving as Chairman of the Presidium of the Supreme Soviet from 1988 to 1989, Chairman of the Supreme Soviet from 1989 to 1990, and President of the Soviet Union from 1990 to 1991. 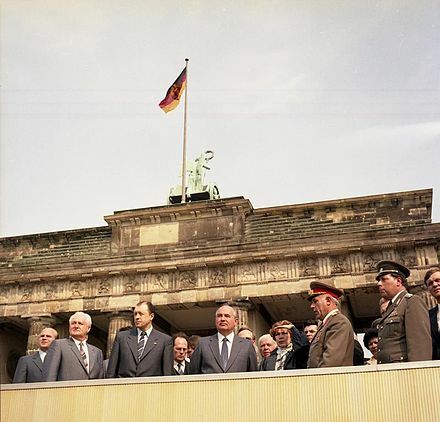 Ideologically, he initially adhered to Marxism-Leninism although by the early 1990s had moved toward social democracy. Privolnoye is a rural locality in Krasnogvardeysky District of Stavropol Krai, Russia, located on the Yegorlyk River. 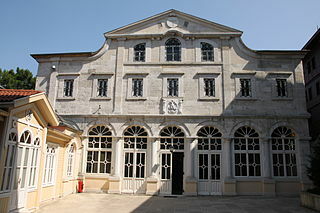 Population: 3,350 (2010 Census); 3,491 (2002 Census). Voronezh is a city and the administrative center of Voronezh Oblast, Russia, straddling the Voronezh River and located 12 kilometers (7.5 mi) from where it flows into the Don. 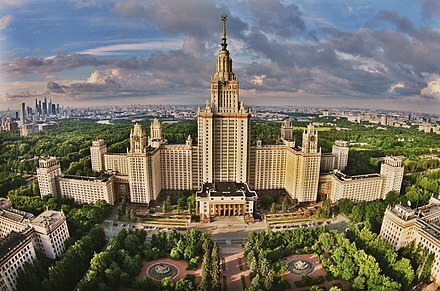 The city sits on the Southeastern Railway, which connects European Russia with the Urals and Siberia, the Caucasus and Ukraine, and the M4 highway (Moscow–Voronezh–Rostov-on-Don–Novorossiysk). Its population in 2016 was estimated to be 1,032,895; up from 889,680 recorded in the 2010 Census; it is the fourteenth most populous city in the country. Viktor Vasilyevich Grishin was a Soviet politician. 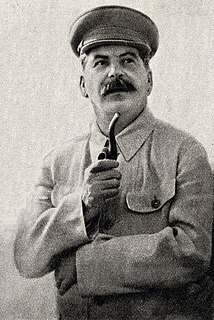 He was a Candidate (1961–1971) and Full Member (1971–1986) of the Politburo of the Central Committee of the Communist Party of the Soviet Union. 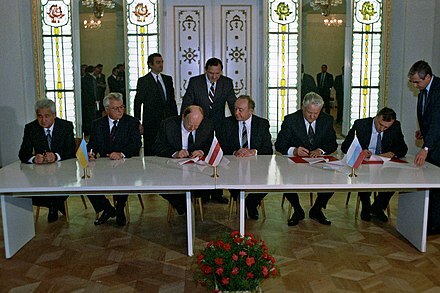 In 1989, elections were held for the Congress of People's Deputies of the Soviet Union. The main elections were held on 26 March and a second round on 9 April. 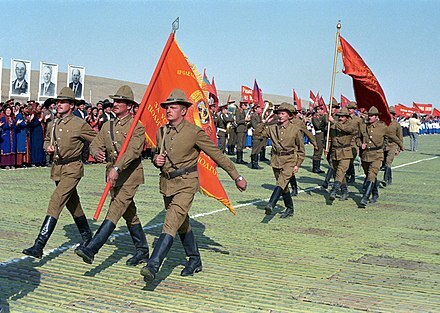 They were the first relatively free nationwide elections held in the Soviet Union, and would prove to be the final national elections held as the country ceased to exist in 1991. 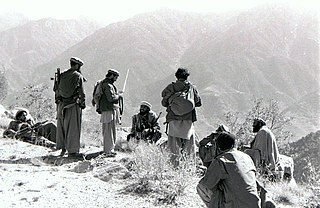 The elections were followed by regional elections in 1990, the last legislative elections to take place in the country. Aleksandr Vladimirovich Vlasov was a Soviet politician, who held different positions, including interior minister and prime minister. 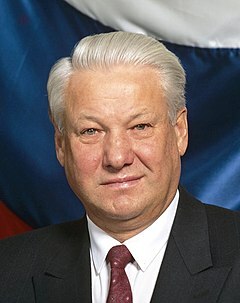 He was the last communist prime minister of Russia, and a close ally of Mikhail Gorbachev. 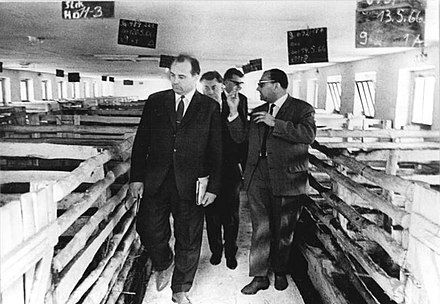 Vsevolod Serafimovich Murakhovsky was a Ukrainian-Russian politician who served as first deputy premier during the Gorbachev Era. 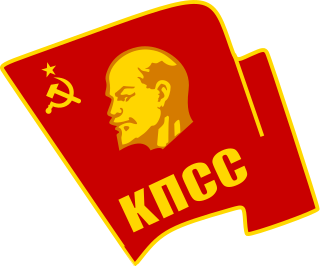 The 27th Central Committee of the Communist Party of the Soviet Union was elected by the 27th Congress, and was in session from 1986 until 1990. 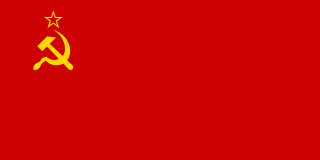 Its 1st Plenary Session elected the 27th Politburo, the 27th Secretariat and the 27th Party Control Committee of the Communist Party of the Soviet Union. 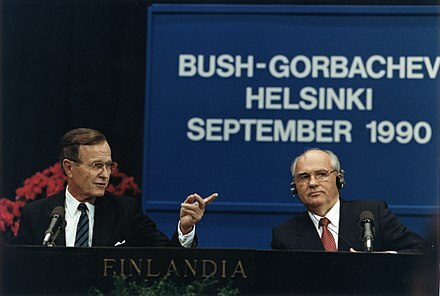 ↑ "Gorbachev". Random House Webster's Unabridged Dictionary . 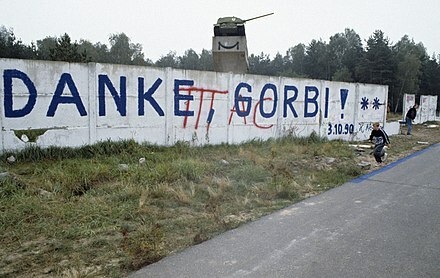 ↑ "Gorbachev". Merriam-Webster Dictionary . Retrieved 4 February 2019. ↑ Medvedev 1986, p. 22; Doder & Branson 1990, p. 1; McCauley 1998, p. 15; Taubman 2017, p. 7. ↑ Taubman 2017, p. 10. ↑ McCauley 1998, p. 15; Taubman 2017, p. 10. ↑ Doder & Branson 1990, p. 4; McCauley 1998, p. 15; Taubman 2017, p. 7. ↑ Taubman 2017, pp. 8–9. ↑ Taubman 2017, p. 9. 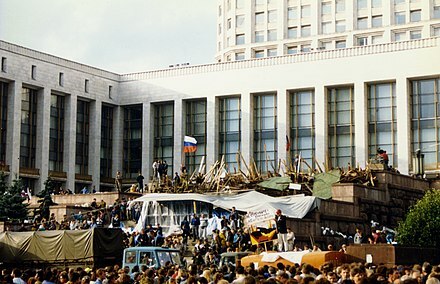 1 2 Medvedev 1986, p. 22. 1 2 Taubman 2017, p. 16. ↑ Taubman 2017, pp. 16, 17. ↑ Doder & Branson 1990, p. 1; Taubman 2017, p. 7. ↑ McCauley 1998, p. 15; Taubman 2017, pp. 12–13. ↑ Taubman 2017, p. 14. ↑ McCauley 1998, p. 16; Taubman 2017, p. 7. ↑ McCauley 1998, pp. 15–16; Taubman 2017, pp. 7, 8. ↑ Taubman 2017, pp. 18–19. ↑ Doder & Branson 1990, pp. 5–6; McCauley 1998, p. 17; Taubman 2017, pp. 7, 20–22. ↑ Doder & Branson 1990, p. 5; McCauley 1998, p. 17; Taubman 2017, pp. 8, 26–27. ↑ Taubman 2017, p. 27. ↑ Taubman 2017, pp. 9, 27–28. ↑ Taubman 2017, pp. 29–30. ↑ Taubman 2017, pp. 8, 28–29. ↑ Taubman 2017, p. 30. ↑ Doder & Branson 1990, p. 7; McCauley 1998, p. 18; Taubman 2017, p. 32. ↑ Taubman 2017, p. 32. ↑ McCauley 1998, p. 18; Taubman 2017, p. 34. ↑ Doder & Branson 1990, p. 6; McCauley 1998, p. 18; Taubman 2017, pp. 8, 34. 1 2 Taubman 2017, p. 42. ↑ Doder & Branson 1990, p. 6, 8; McCauley 1998, p. 18; Taubman 2017, pp. 40–41. ↑ Medvedev 1986, p. 35. ↑ Taubman 2017, p. 43. ↑ Taubman 2017, p. 50. 1 2 Taubman 2017, p. 44. ↑ Doder & Branson 1990, p. 14; Taubman 2017, p. 48. ↑ Taubman 2017, p. 53. ↑ Taubman 2017, p. 52. ↑ McCauley 1998, p. 19; Taubman 2017, pp. 45, 52. ↑ Doder & Branson 1990, p. 10; McCauley 1998, p. 19; Taubman 2017, p. 46. ↑ Taubman 2017, p. 46. ↑ McCauley 1998, p. 19; Taubman 2017, p. 46. ↑ Taubman 2017, p. 47. ↑ Medvedev 1986, pp. 36–37; Doder & Branson 1990, p. 11; McCauley 1998, p. 19; Taubman 2017, pp. 45, 53, 56–57. ↑ McCauley 1998, p. 20; Taubman 2017, pp. 57–58. ↑ Doder & Branson 1990, p. 15; Taubman 2017, pp. 59, 63. ↑ Taubman 2017, pp. 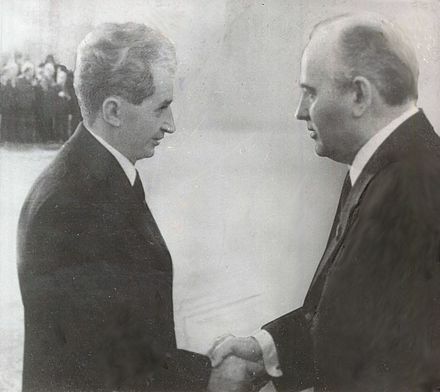 59–63. ↑ Taubman 2017, p. 66. ↑ Taubman 2017, pp. 72–73. 1 2 McCauley 1998, p. 20; Taubman 2017, p. 68. ↑ Taubman 2017, p. 70. ↑ Taubman 2017, pp. 70–71. ↑ Medvedev 1986, p. 42; McCauley 1998, p. 20. ↑ McCauley 1998, p. 20. ↑ McCauley 1998, pp. 20–21; Taubman 2017, pp. 73–74. ↑ McCauley 1998, p. 20; Taubman 2017, p. 74. ↑ McCauley 1998, pp. 20–21; Taubman 2017, p. 75. ↑ McCauley 1998, p. 21; Taubman 2017, p. 77. ↑ Doder & Branson 1990, p. 31; Taubman 2017, p. 78. ↑ Taubman 2017, p. 95. ↑ McCauley 1998, p. 210; Taubman 2017, pp. 81–83. ↑ Taubman 2017, p. 81. ↑ Doder & Branson 1990, p. 19; McCauley 1998, p. 23; Taubman 2017, p. 86. ↑ McCauley 1998, p. 23; Taubman 2017, p. 89. ↑ Medvedev 1986, pp. 56, 62; Doder & Branson 1990, p. 19; McCauley 1998, p. 29; Taubman 2017, pp. 115–116. ↑ Medvedev 1986, p. 63; Doder & Branson 1990, p. 19; McCauley 1998, p. 29; Taubman 2017, pp. 111–113. ↑ Taubman 2017, p. 86. ↑ Taubman 2017, pp. 90–91. ↑ Taubman 2017, p. 90. ↑ Taubman 2017, p. 91. ↑ McCauley 1998, p. 22; Taubman 2017, pp. 96–98. ↑ Taubman 2017, p. 78. ↑ Taubman 2017, p. 80. ↑ Medvedev 1986, p. 74; Doder & Branson 1990, p. 32; McCauley 1998, p. 25; Taubman 2017, pp. 105–106. ↑ Taubman 2017, pp. 103, 105. ↑ Medvedev 1986, p. 47; Doder & Branson 1990, p. 31; McCauley 1998, p. 23; Taubman 2017, p. 98. ↑ McCauley 1998, p. 23; Taubman 2017, p. 100. ↑ Taubman 2017, p. 89. ↑ McCauley 1998, p. 23; Taubman 2017, p. 99. ↑ Taubman 2017, p. 100. ↑ Medvedev 1986, p. 49; McCauley 1998, p. 23. 1 2 3 Taubman 2017, p. 102. ↑ Taubman 2017, p. 149. ↑ Medvedev 1986, p. 50; Doder & Branson 1990, p. 24; McCauley 1998, p. 24. ↑ Taubman 2017, p. 107. ↑ Medvedev 1986, p. 61; McCauley 1998, p. 26. 1 2 Taubman 2017, p. 116. ↑ Medvedev 1986, p. 63; Doder & Branson 1990, p. 32; McCauley 1998, p. 28; Taubman 2017, p. 119. ↑ Medvedev 1986, p. 64. ↑ McCauley 1998, p. 30. ↑ Taubman 2017, pp. 123–124. ↑ Medvedev 1986, pp. 64–65; McCauley 1998, p. 30; Taubman 2017, p. 124. ↑ McCauley 1998, pp. 28–29; Taubman 2017, p. 125. ↑ Taubman 2017, pp. 125–126. ↑ Medvedev 1986, p. 65; Doder & Branson 1990, p. 32; McCauley 1998, p. 29; Taubman 2017, p. 120. ↑ Taubman 2017, pp. 121–122. ↑ Taubman 2017, p. 121. ↑ Medvedev 1986, p. 73; Taubman 2017, p. 121. 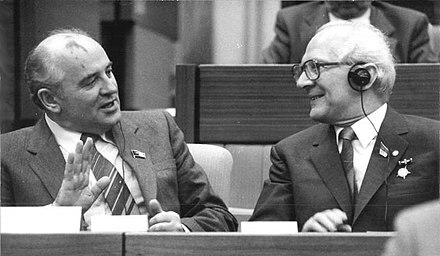 ↑ Medvedev 1986, p. 65. 1 2 Taubman 2017, p. 127. ↑ Taubman 2017, p. 129. ↑ McCauley 1998, pp. 31–32; Taubman 2017, p. 130. ↑ McCauley 1998, p. 33; Taubman 2017, pp. 131–132. ↑ Taubman 2017, p. 123. ↑ Taubman 2017, pp. 128–129. 1 2 Taubman 2017, p. 157. ↑ Doder & Branson 1990, pp. 35–36; Taubman 2017, pp. 138–139. ↑ McCauley 1998, p. 35; Taubman 2017, pp. 145–146. ↑ Medvedev 1986, pp. 108, 113; McCauley 1998, p. 35. ↑ Medvedev 1986, p. 78; Taubman 2017, p. 149. ↑ Taubman 2017, pp. 149–150. ↑ McCauley 1998, p. 30; Taubman 2017, pp. 150–151. ↑ Taubman 2017, pp. 151–152. ↑ Taubman 2017, p. 152. 1 2 Taubman 2017, p. 153. ↑ Taubman 2017, pp. 153–154. ↑ Taubman 2017, p. 156. ↑ Medvedev 1986, p. 77. ↑ Medvedev 1986, p. 92; McCauley 1998, p. 36; Taubman 2017, p. 157. ↑ Taubman 2017, p. 161. ↑ Taubman 2017, pp. 164–175. ↑ Taubman 2017, pp. 165, 166. 1 2 Taubman 2017, p. 165. ↑ McCauley 1998, p. 40; Taubman 2017, p. 166. ↑ Medvedev 1986, pp. 95–96; Doder & Branson 1990, pp. 38–39. ↑ Medvedev 1986, pp. 7, 102–103, 106–107; Doder & Branson 1990, p. 40; Galeotti 1997, p. 32; Taubman 2017, pp. 175–177. ↑ Medvedev 1986, p. 107; Doder & Branson 1990, p. 40. ↑ Taubman 2017, pp. 177–78. ↑ McCauley 1998, p. 34. 1 2 Taubman 2017, p. 173. 1 2 Medvedev 1986, p. 107. ↑ Medvedev 1986, pp. 118, 121–122; Doder & Branson 1990, p. 43; McCauley 1998, p. 41; Taubman 2017, pp. 179–180. ↑ Taubman 2017, p. 180. ↑ Medvedev 1986, p. 123. ↑ Taubman 2017, pp. 181, 191. ↑ Galeotti 1997, p. 32; Taubman 2017, p. 181. ↑ Medvedev 1986, p. 123; Galeotti 1997, p. 32; Taubman 2017, p. 181. ↑ Taubman 2017, p. 182. ↑ Medvedev 1986, p. 124; Doder & Branson 1990, pp. 46–47; McCauley 1998, p. 31; Taubman 2017, pp. 182–185. ↑ Doder & Branson 1990, p. 47; McCauley 1998, p. 31; Taubman 2017, p. 182. ↑ Doder & Branson 1990, p. 50; Taubman 2017, pp. 190–191. ↑ Medvedev 1986, p. 138; Doder & Branson 1990, p. 56. ↑ Medvedev 1986, pp. 138–139; Doder & Branson 1990, pp. 51–52; McCauley 1998, p. 43; Taubman 2017, p. 192. ↑ Doder & Branson 1990, p. 57; McCauley 1998, p. 43; Taubman 2017, p. 193. ↑ Taubman 2017, p. 193. 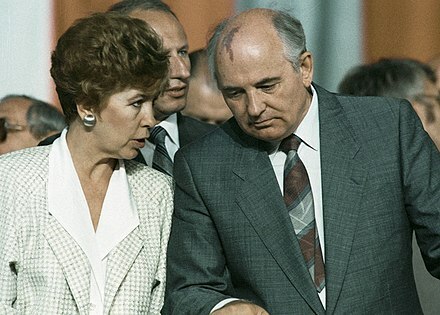 ↑ Medvedev 1986, pp. 158–159; Taubman 2017, pp. 193–195. ↑ Medvedev 1986, p. 142; Taubman 2017, p. 196. ↑ McCauley 1998, p. 44; Taubman 2017, p. 195. ↑ Medvedev 1986, p. 155. ↑ Medvedev 1986, p. 159; Doder & Branson 1990, p. 59; McCauley 1998, p. 44; Taubman 2017, p. 196. ↑ Medvedev 1986, p. 159; McCauley 1998, p. 44; Taubman 2017, p. 201. ↑ Taubman 2017, p. 197. ↑ Medvedev 1986, p. 4; Doder & Branson 1990, p. 62; McCauley 1998, p. 45; Taubman 2017, p. 204. ↑ Doder & Branson 1990, pp. 63–64; McCauley 1998, p. 45. ↑ Taubman 2017, pp. 205–206. ↑ Medvedev 1986, p. 16; McCauley 1998, p. 46; Taubman 2017, pp. 211–212. ↑ Doder & Branson 1990, p. 69. ↑ Doder & Branson 1990, p. 65. ↑ Doder & Branson 1990, p. 66. ↑ Doder & Branson 1990, p. 87; McCauley 1998, p. 59; Taubman 2017, p. 213. ↑ Medvedev 1986, pp. 194–195; Doder & Branson 1990, p. 101; McCauley 1998, p. 60; Taubman 2017, p. 237. ↑ Taubman 2017, p. 228. ↑ Doder & Branson 1990, p. 76. ↑ Doder & Branson 1990, p. 20; Taubman 2017, pp. 224–226. ↑ McCauley 1998, p. 54; Taubman 2017, p. 223. ↑ McCauley 1998, pp. 52, 55. ↑ Doder & Branson 1990, p. 100; Taubman 2017, pp. 219–220. ↑ Medvedev 1986, p. 177; Doder & Branson 1990, p. 95; McCauley 1998, p. 52; Taubman 2017, p. 220. ↑ Doder & Branson 1990, p. 97; Taubman 2017, p. 221. ↑ Medvedev 1986, p. 177; McCauley 1998, p. 53; Taubman 2017, p. 222. 1 2 Doder & Branson 1990, p. 94. ↑ McCauley 1998, p. 54. ↑ McCauley 1998, p. 52. ↑ McCauley 1998, p. 50. ↑ McCauley 1998, p. 55. ↑ Doder & Branson 1990, p. 81. ↑ Doder & Branson 1990, p. 82. ↑ McCauley 1998, pp. 51, 55; Taubman 2017, p. 235. ↑ McCauley 1998, pp. 50–51. ↑ Taubman 2017, p. 236. ↑ McCauley 1998, p. 56. ↑ Taubman 2017, pp. 236–237. ↑ McCauley 1998, pp. 56, 57. ↑ McCauley 1998, p. 57. ↑ McCauley 1998, pp. 61–62. ↑ Doder & Branson 1990, p. 167; McCauley 1998, p. 58. 1 2 Doder & Branson 1990, p. 166. ↑ Tarschys 1993, p. 16; Bhattacharya, Gathmann & Miller 2013, p. 236. ↑ Taubman 2017, pp. 232, 234. 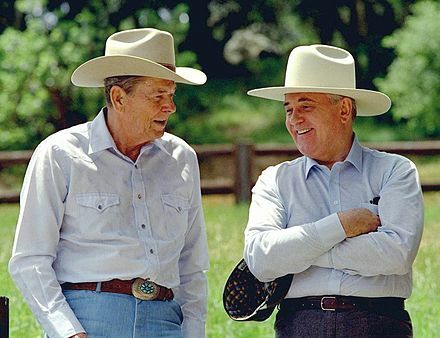 ↑ Medvedev 1986, pp. 187–188; Doder & Branson 1990, p. 86; Bhattacharya, Gathmann & Miller 2013, p. 236. ↑ Tarschys 1993, p. 19; Bhattacharya, Gathmann & Miller 2013, p. 236. ↑ Taubman 2017, p. 232. ↑ Medvedev 1986, p. 188; Tarschys 1993, p. 20. ↑ McCauley 1998, p. 62; Taubman 2017, p. 233. ↑ Taubman 2017, p. 233. ↑ Tarschys 1993, p. 22; Bhattacharya, Gathmann & Miller 2013, p. 238. ↑ Bhattacharya, Gathmann & Miller 2013, pp. 233, 238. ↑ Doder & Branson 1990, p. 120. ↑ Doder & Branson 1990, pp. 75, 140, 142. ↑ Doder & Branson 1990, pp. 142–143. ↑ Doder & Branson 1990, p. 93. ↑ Doder & Branson 1990, p. 172; Taubman 2017, pp. 250–251. ↑ Doder & Branson 1990, p. 143. ↑ Doder & Branson 1990, p. 148. ↑ Taubman 2017, p. 251. ↑ Doder & Branson 1990, pp. 146–147. 1 2 Taubman 2017, p. 322. 1 2 Taubman 2017, p. 324. ↑ McCauley 1998, p. 71; Taubman 2017, pp. 323, 326–328. 1 2 Taubman 2017, p. 329. ↑ Taubman 2017, p. 330. ↑ Doder & Branson 1990, p. 129; Taubman 2017, p. 240. ↑ Taubman 2017, p. 240. 1 2 Taubman 2017, p. 241. ↑ Doder & Branson 1990, p. 134. ↑ Doder & Branson 1990, p. 137. ↑ Taubman 2017, pp. 242–243. ↑ Taubman 2017, p. 266. 1 2 3 4 Taubman 2017, p. 271. 1 2 3 Taubman 2017, p. 272. ↑ Taubman 2017, pp. 272–273. 1 2 Taubman 2017, p. 263. ↑ Taubman 2017, p. 275. ↑ Taubman 2017, p. 278. ↑ Doder & Branson 1990, p. 109; Taubman 2017, p. 278. 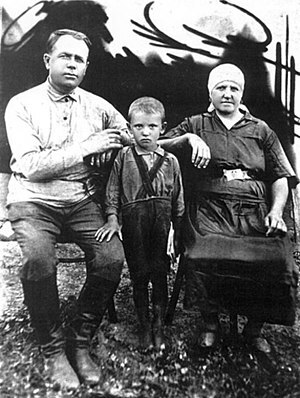 ↑ Medvedev 1986, pp. 237–238; McCauley 1998, p. 142; Taubman 2017, pp. 278–279. ↑ Taubman 2017, p. 285. 1 2 Taubman 2017, p. 286. ↑ Taubman 2017, pp. 289–291. ↑ Doder & Branson 1990, p. 114. ↑ Taubman 2017, p. 484. ↑ McCauley 1998, p. 80; Taubman 2017, p. 291. ↑ Doder & Branson 1990, pp. 159–162; McCauley 1998, p. 81; Taubman 2017, p. 294. ↑ McCauley 1998, pp. 80–81; Taubman 2017, pp. 297–301. 1 2 Taubman 2017, p. 304. ↑ Taubman 2017, p. 267. ↑ Doder & Branson 1990, pp. 154–155. ↑ Doder & Branson 1990, p. 222. ↑ Doder & Branson 1990, pp. 191–192; Taubman 2017, pp. 307, 309. ↑ Taubman 2017, p. 308. ↑ Taubman 2017, p. 310. ↑ Taubman 2017, p. 311. ↑ Taubman 2017, p. 312. ↑ Doder & Branson 1990, p. 239; Taubman 2017, p. 313. ↑ McCauley 1998, p. 115; Taubman 2017, pp. 434–435, 449–450. ↑ McCauley 1998, p. 116; Taubman 2017, p. 450. 1 2 Taubman 2017, p. 314. ↑ Taubman 2017, pp. 338–339. ↑ Taubman 2017, p. 317. ↑ Taubman 2017, p. 315. ↑ Doder & Branson 1990, p. 151; Taubman 2017, p. 341. ↑ McCauley 1998, p. 131. ↑ Doder & Branson 1990, p. 217; Taubman 2017, p. 397. ↑ Doder & Branson 1990, p. 74; Taubman 2017, p. 340. ↑ Doder & Branson 1990, p. 290; Taubman 2017, p. 340. ↑ Doder & Branson 1990, pp. 186–187. ↑ Doder & Branson 1990, p. 195. ↑ Doder & Branson 1990, p. 246; Taubman 2017, p. 319. ↑ Doder & Branson 1990, p. 281; McCauley 1998, p. 92; Taubman 2017, pp. 320–321. ↑ Doder & Branson 1990, p. 282; Taubman 2017, p. 321. ↑ Doder & Branson 1990, pp. 305–306; McCauley 1998, pp. 93–94; Taubman 2017, p. 342. ↑ Taubman 2017, pp. 345–346. ↑ McCauley 1998, p. 94; Taubman 2017, pp. 346–349. ↑ Taubman 2017, pp. 349–350. ↑ Doder & Branson 1990, pp. 192–193; McCauley 1998, pp. 94–95; Taubman 2017, p. 351. ↑ Taubman 2017, p. 353. ↑ McCauley 1998, p. 105; Taubman 2017, pp. 353–354. ↑ Taubman 2017, p. 354. ↑ Taubman 2017, p. 352. ↑ Taubman 2017, p. 359. ↑ McCauley 1998, p. 100; Taubman 2017, p. 371. ↑ McCauley 1998, pp. 104–105; Taubman 2017, pp. 428–429. ↑ McCauley 1998, pp. 104–105; Taubman 2017, pp. 429–430. ↑ McCauley 1998, p. 107; Taubman 2017, p. 444. ↑ McCauley 1998, pp. 106–107; Taubman 2017, pp. 431–432. ↑ Taubman 2017, p. 433. ↑ Taubman 2017, p. 434. 1 2 McCauley 1998, p. 108; Taubman 2017, p. 442. ↑ McCauley 1998, p. 109; Taubman 2017, p. 444. ↑ Taubman 2017, pp. 445–448. ↑ Taubman 2017, pp. 456–457. ↑ Taubman 2017, p. 387. ↑ Taubman 2017, pp. 386–387. ↑ Doder & Branson 1990, p. 231; McCauley 1998, pp. 83, 142; Taubman 2017, p. 387. ↑ Doder & Branson 1990, pp. 217, 220; McCauley 1998, p. 84, 143; Taubman 2017, pp. 390–392. ↑ McCauley 1998, p. 143; Taubman 2017, pp. 475–476. ↑ Taubman 2017, pp. 387–388. ↑ McCauley 1998, p. 43; Taubman 2017, pp. 388–389. ↑ Taubman 2017, pp. 476–478. ↑ McCauley 1998, p. 144. ↑ Taubman 2017, p. 392. ↑ Taubman 2017, pp. 478–479. ↑ Taubman 2017, pp. 479–480. ↑ Doder & Branson 1990, pp. 208–209. ↑ Doder & Branson 1990, p. 215. ↑ Taubman 2017, pp. 393–394. ↑ Taubman 2017, pp. 394–396. ↑ Doder & Branson 1990, pp. 234–237; Taubman 2017, pp. 396–397. ↑ McCauley 1998, p. 138; Taubman 2017, pp. 401–403. ↑ Taubman 2017, p. 401. ↑ Taubman 2017, pp. 411, 413. ↑ Taubman 2017, p. 414. ↑ Taubman 2017, p. 415. ↑ Taubman 2017, pp. 416–417. ↑ Taubman 2017, p. 419. ↑ McCauley 1998, p. 139; Taubman 2017, pp. 421–422. ↑ McCauley 1998, p. 139; Taubman 2017, pp. 422–426. ↑ Taubman 2017, pp. 467–470. ↑ McCauley 1998, pp. 140–141; Taubman 2017, pp. 494–496. ↑ Taubman 2017, pp. 496–497. ↑ Taubman 2017, p. 498. ↑ McCauley 1998, p. 142. ↑ McCauley 1998, pp. 74–75. ↑ Doder & Branson 1990, p. 268; McCauley 1998, p. 76; Taubman 2017, p. 367. ↑ Doder & Branson 1990, p. 302; Taubman 2017, p. 386. ↑ Doder & Branson 1990, pp. 267–268, 299–300; McCauley 1998, p. 119; Taubman 2017, p. 368. ↑ Taubman 2017, p. 368. ↑ Doder & Branson 1990, p. 301; Taubman 2017, p. 369. ↑ Doder & Branson 1990, p. 301; McCauley 1998, p. 119; Taubman 2017, pp. 369–370. ↑ Taubman 2017, p. 370. ↑ McCauley 1998, p. 159; Taubman 2017, pp. 504–505. ↑ McCauley 1998, p. 130; Taubman 2017, pp. 436–437. ↑ McCauley 1998, pp. 126–127; Taubman 2017, p. 435. ↑ McCauley 1998, p. 128; Taubman 2017, p. 452. ↑ McCauley 1998, p. 128. ↑ McCauley 1998, pp. 157–158; Taubman 2017, p. 503. ↑ Doder & Branson 1990, p. 212; McCauley 1998, p. 32. ↑ Taubman 2017, p. 386. ↑ Taubman 2017, p. 379. ↑ Taubman 2017, pp. 381, 382, 383. ↑ Doder & Branson 1990, p. 230. ↑ Taubman 2017, pp. 384–385. ↑ Doder & Branson 1990, p. 230; Taubman 2017, p. 385. 1 2 Taubman 2017, p. 465. ↑ Taubman 2017, pp. 465–466. ↑ McCauley 1998, p. 133; Taubman 2017, p. 481. ↑ McCauley 1998, pp. 35–36; Taubman 2017, pp. 484–485. ↑ Taubman 2017, pp. 462–463. ↑ Taubman 2017, pp. 488–494. ↑ Taubman 2017, p. 427. ↑ Taubman 2017, p. 505. ↑ Taubman 2017, pp. 505–506. ↑ Taubman 2017, pp. 506–507. ↑ McCauley 1998, pp. 160–161; Taubman 2017, p. 507. ↑ McCauley 1998, p. 165; Taubman 2017, pp. 508–509. 1 2 Taubman 2017, p. 509. ↑ McCauley 1998, pp. 164–165; Taubman 2017, p. 509. ↑ McCauley 1998, pp. 165–166; Taubman 2017, p. 511. ↑ McCauley 1998, p. 161; Taubman 2017, pp. 510–522. ↑ McCauley 1998, p. 170; Taubman 2017, p. 513. ↑ McCauley 1998, p. 169; Taubman 2017, pp. 513–514. 1 2 Taubman 2017, p. 515. ↑ McCauley 1998, p. 172. ↑ McCauley 1998, pp. 174–175; Taubman 2017, pp. 500–501, 515–516. ↑ Taubman 2017, p. 543. 1 2 Taubman 2017, p. 552. ↑ Taubman 2017, p. 550. ↑ Taubman 2017, p. 546. ↑ Taubman 2017, p. 547. ↑ Taubman 2017, p. 558. ↑ Taubman 2017, p. 564. ↑ Taubman 2017, p. 565. ↑ Taubman 2017, pp. 540–541. ↑ McCauley 1998, p. 213; Taubman 2017, pp. 540–541, 566–567. ↑ Taubman 2017, pp. 567–568. ↑ Taubman 2017, p. 568. ↑ Taubman 2017, pp. 588–589. ↑ McCauley 1998, p. 220; Taubman 2017, p. 572. ↑ Taubman 2017, p. 572. ↑ McCauley 1998, p. 214. ↑ Taubman 2017, pp. 568–569. ↑ McCauley 1998, pp. 218–219; Taubman 2017, p. 593. ↑ Taubman 2017, p. 570. ↑ McCauley 1998, p. 215; Taubman 2017, pp. 595–596. ↑ McCauley 1998, pp. 218–219; Taubman 2017, p. 595. ↑ McCauley 1998, p. 214; Taubman 2017, p. 595. ↑ Taubman 2017, p. 569. ↑ McCauley 1998, p. 221; Taubman 2017, pp. 596–598. ↑ McCauley 1998, p. 178; Taubman 2017, pp. 519–520. ↑ McCauley 1998, pp. 183–185; Taubman 2017, pp. 521–524. ↑ Taubman 2017, pp. 525, 528. ↑ McCauley 1998, pp. 185–186; Taubman 2017, p. 529. ↑ Taubman 2017, p. 530. ↑ Taubman 2017, p. 529. ↑ Taubman 2017, pp. 530–531. ↑ Taubman 2017, p. 532. ↑ Taubman 2017, p. 533. ↑ McCauley 1998, p. 188; Taubman 2017, p. 533. ↑ Taubman 2017, p. 536. ↑ McCauley 1998, pp. 193–194; Taubman 2017, pp. 534–535. ↑ Taubman 2017, p. 531. ↑ Taubman 2017, p. 539. ↑ Taubman 2017, p. 575. ↑ McCauley 1998, pp. 199–200; Taubman 2017, p. 575. ↑ Taubman 2017, pp. 575–576. ↑ Taubman 2017, pp. 576–577. ↑ McCauley 1998, p. 208; Taubman 2017, pp. 577–578. ↑ McCauley 1998, pp. 209–210; Taubman 2017, p. 579. ↑ McCauley 1998, pp. 206–207; Taubman 2017, p. 580. ↑ Taubman 2017, pp. 580–582. ↑ McCauley 1998, p. 233; Taubman 2017, pp. 602, 605. ↑ Taubman 2017, pp. 607–608. ↑ McCauley 1998, p. 235; Taubman 2017, pp. 607–608. ↑ Taubman 2017, p. 608. ↑ Taubman 2017, pp. 608–610. ↑ McCauley 1998, p. 237; Taubman 2017, p. 610. ↑ McCauley 1998, pp. 237–238; Taubman 2017, p. 611. 1 2 Taubman 2017, p. 612. ↑ Taubman 2017, pp. 614–615. ↑ Taubman 2017, p. 621. ↑ McCauley 1998, p. 244; Taubman 2017, p. 621. ↑ McCauley 1998, p. 239; Taubman 2017, p. 621. ↑ McCauley 1998, p. 244; Taubman 2017, p. 622. ↑ McCauley 1998, pp. 248–249; Taubman 2017, pp. 631–632. ↑ McCauley 1998, p. 249; Taubman 2017, p. 633. ↑ Taubman 2017, p. 624. ↑ McCauley 1998, p. 252; Taubman 2017, p. 627. ↑ Taubman 2017, p. 628. ↑ McCauley 1998, p. 253; Taubman 2017, pp. 628–629. ↑ McCauley 1998, pp. 254–255; Taubman 2017, pp. 629–630. ↑ McCauley 1998, p. 255; Taubman 2017, p. 630. ↑ Taubman 2017, pp. 634–635. ↑ McCauley 1998, p. 256; Taubman 2017, p. 625. ↑ Taubman 2017, p. 636. 1 2 Taubman 2017, p. 637. ↑ Francis X. Clines, "11 Soviet States Form Commonwealth Without Clearly Defining Its Powers", The New York Times , December 22, 1991. 1 2 Taubman 2017, p. 638. ↑ McCauley 1998, p. 257; Taubman 2017, p. 645. ↑ Taubman 2017, p. 646. ↑ Taubman 2017, p. 651. ↑ Brzezinski, Zbigniew; Brzezinski, Zbigniew K.; Sullivan, Paige (1997). 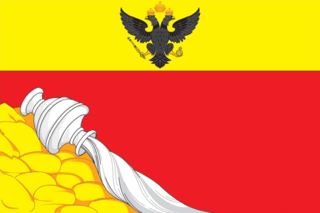 Russia and the Commonwealth of Independent States: Documents, Data, and Analysis. ISBN 9781563246371. ↑ McCauley 1998, p. 258. 1 2 Taubman 2017, p. 653. ↑ McCauley 1998, p. 258; Taubman 2017, pp. 651, 654. 1 2 3 Taubman 2017, p. 654. 1 2 3 Taubman 2017, p. 652. 1 2 Taubman 2017, p. 656. ↑ Taubman 2017, pp. 656–657. ↑ Taubman 2017, p. 657. ↑ Taubman 2017, pp. 654–655. ↑ McCauley 1998, pp. 258–259; Taubman 2017, p. 664. 1 2 Taubman 2017, p. 675. 1 2 Taubman 2017, p. 655. ↑ Taubman 2017, p. 658. 1 2 Taubman 2017, p. 659. ↑ Taubman 2017, pp. 652–653. ↑ Taubman 2017, p. 660. ↑ Taubman 2017, pp. 660–661. 1 2 Taubman 2017, p. 661. ↑ Taubman 2017, p. 662. 1 2 Taubman 2017, p. 663. ↑ Taubman 2017, pp. 663–664. ↑ Taubman 2017, pp. 664–665. ↑ Taubman 2017, pp. 658–659. ↑ Taubman 2017, p. 665. ↑ Taubman 2017, pp. 666–667. ↑ Taubman 2017, p. 668. ↑ Taubman 2017, p. 674. 1 2 Taubman 2017, p. 676. 1 2 Taubman 2017, p. 677. 1 2 Taubman 2017, p. 679. 1 2 3 4 5 Taubman 2017, p. 678. 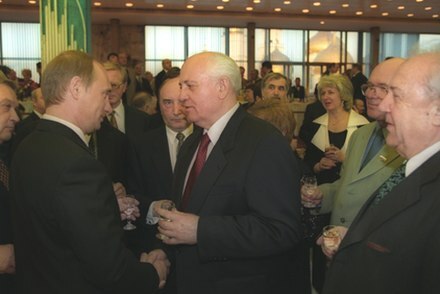 ↑ "Russia Bans Party Founded by Gorbachev - NEWS - MOSNEWS.COM". web.archive.org. 23 April 2007. Archived from the original on 23 April 2007. 1 2 Taubman 2017, p. 680. 1 2 3 4 5 Taubman 2017, p. 685. ↑ Taubman 2017, pp. 685–686. ↑ Blomfield, Adrian; Smith, Mike (6 May 2008). 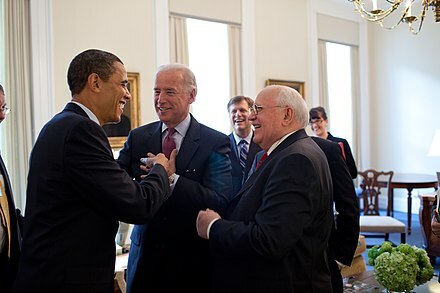 "Gorbachev: US could start new Cold War". The Telegraph. London. 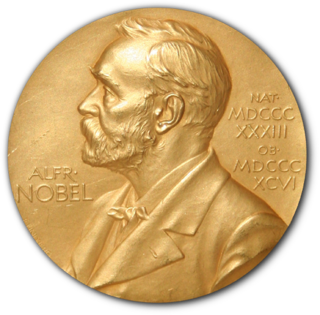 Retrieved 11 March 2015. 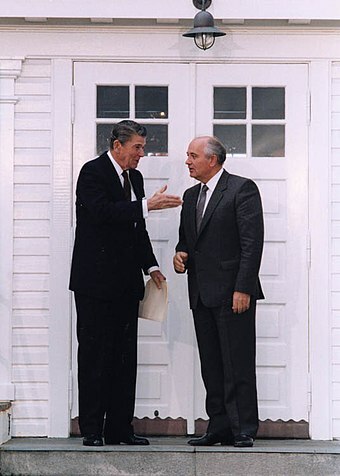 ↑ "Reagan funeral guest list". BBC News . 10 June 2004. Retrieved 30 January 2019.